← Does Your Book Tote a Badge? What Became of the Story? At quick glance, this author’s remark probably means little to you, so much, you may be tempted to hit the back button about now, but hold on a wee graceful moment; please. In an effort to make the purpose of these words personal, allow me the privilege of a couple questions. These questions aren’t meant to be convicting or accusatory, merely revealing. 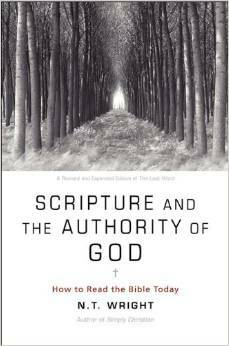 In his book, Scripture and the Authority of God, N.T. Wright suggests that much of mainstream Christianity has adopted a notion of scriptural authority that detaches the Bible from its narrative context. The result? Authority is now isolated from both the gift and the goal of the Kingdom. The significance of keeping scripture intact is massaged out in the author’s description of ‘acts’ (as in a play, but not to be confused with dispensations) that create chapters in the story. We live and work in the fifth act that was inaugurated at Pentecost, preceded by (1) Act 1: Genesis 1-2; (2) Act 2: Genesis 3 – 11; (3) Act 3: Genesis 12 through the coming of the Messiah; (4) Act 4 (The Climax): The life, death, resurrection, and ascension of Jesus. From a personal note I can confess to experiencing a less than interested effort in the mission of God (which is the mission the church is called in to) by reading the complete story bit-pieced, labeling it ‘studies for maturing in the faith.’ Personalizing a text may not be the worst thing in the world, but if it distracts from my responsibility as a citizen of the Kingdom, then I need to reconsider if I am misappropriating the Bible’s authority. If the Bible will be authoritative, which is only shorthand for the authority of God, according to Wright, then its story, which tells us of how God is renewing His creation through His Son, then, I think to where the author is leading us, we seek to learn to once again tell the story in full. If you care to see how predominant was this method of sharing the gospel for the first Christians, examine how the authors of the New Testament were consistently presenting the good news by beginning with Israel’s story and concluding with Jesus as its climactic apex. It seems hardly fair then to jump straight from a fall in a garden to a crucifixion on a hill, for that story is incomplete, at best reminiscent of “Once upon a time, they lived happily ever after.” Yes, but what about the story in between? This entry was posted in Books and tagged Authority and Scripture, book reviews, Christianity, faith. Bookmark the permalink. 4 Responses to What Became of the Story? N.T. Wright has missed the fundamental narrative of the scripture and the importance of the”Jewish” story as it is referred to. Sadly many join him in seeing the change. The focus on the Kingdom remains constant but when the King of the Kingdom appeared the narrative moved forward. God’s relationship with the Jews highlighted that they could not remain loyal as imperfect humans and therefore the law became the Tutor leading to the Christ. Once the Christ was identified again the law is complete because through it we have identified “the way, the truth and the life”. Opinion based on subjective views and personal conclusions always brings the writer to the point they want to make – hence N.T. Wright feels that the statements and conclusions reached in the book are in some way informative. Your final paragraph highlights the key issue – the Bible starts with the Creation event and the universal issue – now when read from that start point God’s dealings with humans to the point of Christ explains just why we need Gods Kingdom today. Well, it is about time you posted something, my friend! I was starting to get worried. Hi Jim… and many thanks. We have no doubt been preoccupied, with our normal cruising endeavor for the holidays but more importantly, basking in the birth of a new Granddaughter! I see many posts coming from your side of the world and am greatly enthused (admitting here that when you fall silent, we pray for more). Any-and-who, the intents are positive to catch up over your way as some super-interesting topics have surfaced… see you there soon. On a note for future posts (yours), have you considered the likes of Wright, Enns, and others who have tried to reconcile the disturbance between where we are today and where we were then (early church) by demonstrating how far we have come from the first century understanding of the Story, and how this variance opens doors for an unrealistic grasp of the gospel’s intent, possibly explaining the masses of misunderstandings and interpretations plaguing the church today? Congratulations on the granddaughter. I suppose you will have to upgrade to a newer, bigger phone too carry all her photos around! I haven’t considered the writers you mentioned. I have so many “posts in progress” in my head at least, and I am running to catch up with them! Thanks for the suggestions.